Guess Gore-Tex got the memo about their gear being too hot for cyclists in the PNW, cause I just test rode a new Castelli jersey that worked like a breathable membrane should. It breathed. Also passed the tortilla test – put a stale corn tortilla in the back pocket. After a ride, if it’s steamed and ready to eat, you know that moisture is moving away from your body. I’m real picky about gear and this kit is very nice. It’s also what you wear at your best racing/riding weight because of the aspirational fit. You know how women wiggle into their skinniest jeans? Castelli has always run small and tight. I sucked it in to pull up the bibs and held it in to zip the jacket up. I’m at my going into road racing season weight. The Gabba WS Rain Jersey was such a spectacular success in the pro peloton that we couldn’t resist making a longsleeve version for those nasty training days. Waterproof fabric with remarkable stretch and breathability, but with an almost weightless feel when on the body. Cut long in back to keep wheel splash at bay, and with generous zippered vents along the side. We have been able to make race-wear that’s fully protective, very stretchy, and yet so breathable that you can keep the entire thing closed up without overheating. I saw this stretchy-Gore material last year at Press Camp when I met with Gore-Tex. The material is uniquely suited for PNW cycling and I was impressed on the ride. The Free Aero Race Bib/Shorts Castelli sent with the jersey, ranks as one of the “best” shorts I’ve worn. It features an all-day in the saddle pad, stretchy comfort, and a wide-band leg gripper. The amount of tech and thoughtfulness in the jersey and shorts indicate to me, Castelli is a company that’s really into the sport. They just had a win with Vanmarcke and Garmin at Omloop. Find Castelli at a retailer near you or online. Check their sizing first and I suggest choose a size up. The jersey retails for $149.00 and the shorts $229.99. 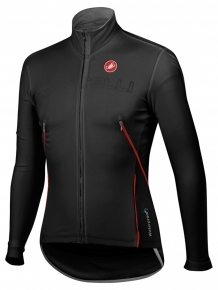 If you’re into high-performance and the best kit you can buy, this Castelli is worth it. Excluding sleet, rode in all known precipitation forms today with a jacket over the jersey. Worked like a finely tuned microclimate.